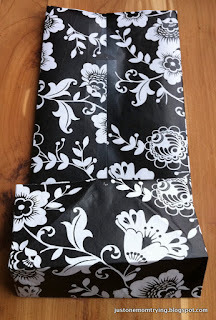 You can make gift bags, treat bags, or lunch bags from any kind of paper. These are especially handy if you're trying to save some cash or have a particular paper design you'd like to use to match a party theme. 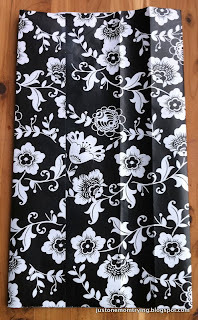 Here is a step by step guide on how to make your own decorative bag. It looks a little overwhelming at first but it is really easy. After you do the first one you'll get the hang of it and you'll be able to make bigger bags or smaller bags. 1) Start out with your paper faced down on your table- long sides of the rectangle at the top and bottom, shorter sides on the right and left. 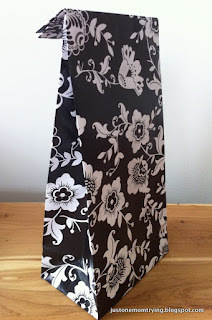 2) Bring the right and left sides together in the middle, overlapping one of the sides slightly (about 1/2"). When your seam is all lined up, press the sides down flat and tape the seam shut. 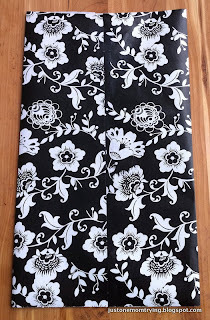 3) Roll the taped middle seam to the right about 1.5" and press sides down to create a new side seam. Roll the original taped middle seam back to the middle then roll it to the left about 1.5". Now you should have 3 side seams on each side. 4) Push the middle side seams inward and flatten your "bag" down. 5) Now we'll work on the bottom of the bag. Fold the last 2" of the bag upward. 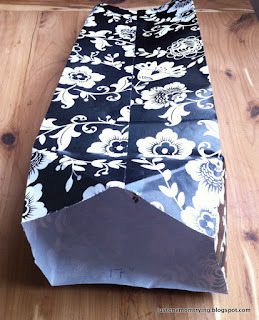 7) Unfold the bag and open the bottom to create a rectangle. 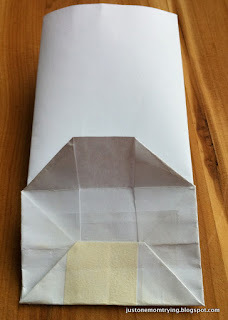 Push the sides of the rectangle in, as though you were wrapping a gift box without the box. It makes it easier to fold the bottom if you stand the bag upside down with the bottom part up. 8) Line up the seams so you have a crisp base on your bag. At this point you can collapse your bag down to make it easier to tape (or glue) down. 9) Tape the side with the original middle seam up first. 10) Tape the side with no seam down second. Here's a way you can create "windows" in your treat bags. 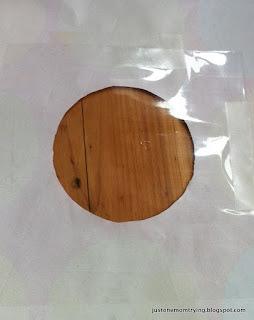 I'm using this wrapping paper because it has a circle I can cut out quite easily. Cut out your window shape and then glue (or tape) cellophane over your window. Proceed to follow steps 1-10 above. 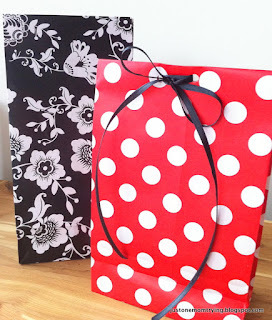 I love this red and white polka dot paper. Can you imagine how cute it would be for a Minnie Mouse themed birthday party? Or, add a pretty green ribbon for the holidays! Great tutorial! I prefer gift bags over paper and this is good to know! Thanks for sharing it! I hope you'll share more of your projects too! Found you on Pintrest and just made a bunch of these in tiny sizes for wrapping the ornaments my kids made for Christmas. Thanks so much, they're adorable! thank you! i'm not super crafty, but this was very easy to follow! i used an old grocery bag so i could decorate it myself. i found putting some blocks in the bottom helped to get a crisper edge. This was a great tutorial. I am in China and it is hard for me to access a place that sells gift bags. This saved me in a pinch! Gift bags from wrapping paper is the excellent idea. This is such an amazing tutorial! 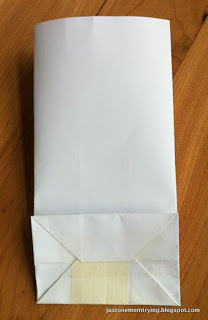 Now, one can easily make gift bags by themselves. I will surely try to make it this weekend. Thanks! 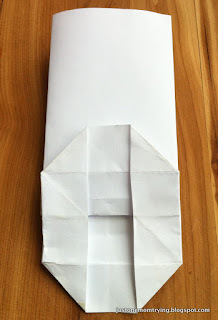 I used your simple to follow tutorial to make a paper lunch bag for my daughter's field trip. Seriously saved the day since I could not make it to the store to buy one. She is sure she will have the "best" one since she picked princess wrapping paper instead of brown paper. Needless to say I reinforced with lots of tape. Fingers crossed it holds. Thanks for posting this. I had forgotten how to do this! I like the floral in your diy tutorial. 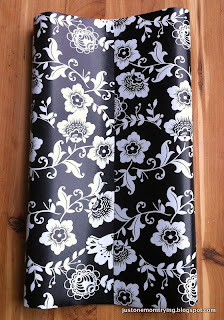 Traditionally people were least concerned about the wrapping gifts in attractive papers. However, as the time pasted now taste of people have changed and they have started looking for gift wrapping paper online. Baby shower gift wrapping paper is frequently brilliant and vivid, identical to lace, and they won’t just be suitable baby shower-themed, yet they will likewise be valuable once the baby is conceived. The increasing trend of baby showers is the talk of the town. Every expecting couple plans to have a baby shower. 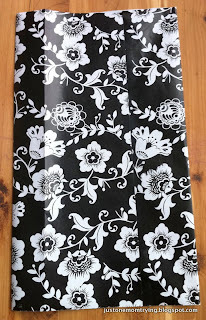 It is very difficult to select a perfect gift for a baby shower and it is much more difficult to select baby shower gift wrapping paper. From gold gift wrapping paper to blessing packs and tissue paper, we have quite recently the thing to enable you to give your blessing an exceptional thrive. 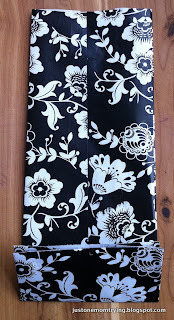 Gold gift wrapping paper make it so easy and affordable. I'm just one mom trying to make family life fun, delicious, and memorable. Follow me for inexpensive at-home dating ideas, recipes, crafts, tips, and other ideas. Is the Costco Rotisserie Chicken a Good Deal?